Me: Hey Little, what do you want for Christmas this year? Well, I think we can handle that. If only all of our Christmases would be so unsullied by targeted marketing. It’s been slow reading this month. I’ve been making my way through the never-ending book, otherwise known as The River Why, and haven’t really accomplished much else. It’s also been a busy month on PaperBackSwap which means I’ve added a few books to the stack. The Whistling Season by Ivan Doig – I came across this book in an Amazon search and thought it sounded interesting. We’ll see if it is. The Second Summer of the Sisterhood by Ann Brashares – I read The Sisterhood of the Traveling Pants back in the Spring and enjoyed it for a quick, fun read. My BFF and I are completing the series now, and then we’re going to watch the movies together (assuming we can find a time/way to do so without the kids underfoot). A Thread of Grace by Mary Doria Russell – another Amazon search find. The book is set in Italy in 1943, toward the end of the war, and tells the story of Jewish refugees searching for safety. I enjoy reading about this era (both historical writing and fiction) and am looking forward to this book. 1776 by David McCullough – This is a book that I’ve wanted to read for quite some time and am finally putting in my stack. During the last month I’ve finished two books, The River Why and Nights in Rodanthe. I really liked The River Why; it wasn’t an easy read but definitely worth it. If you know anything about fishing you would probably understand it better than I did, but the story is a back to earth type story with a spiritual journey theme. I found it pretty interesting. I read Nights in Rodanthe because my best friend and I were planning to go see the movie. It was a basic Nicholas Sparks book – sweet, sappy, easy to read. 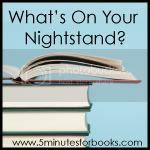 That’s what’s on my nightstand; check out What’s on Your Nightstand? at 5 Minutes for Books to see what other bloggers are reading. Happy Reading! I’m joining the Menu Plan masses this week, and, if all goes as planned, I’ll be cooking like crazy. In addition to our normal meals, I will do some baking and make our Thanksgiving meal. This year we are doing Thanksgiving at home for the first time. We will have our Thanksgiving feast on Friday so we can celebrate with my parents. I also hope to make pumpkin chocolate chip muffins, blueberry muffins, cinnamon rolls, and bread this week. I hope everyone has a great week and a Happy Thanksgiving! Boo is mobile. Last week he decided to get up on all fours and head out to explore the world. He’s been doing an army crawl/lunge-and-pull-your-body type thing for a couple of weeks, but since he started getting his knees into the action he’s quicker. It’s hard to say he’s actually crawling, because he doesn’t do the traditional cross-crawl, but he definitely gets where he wants to go. And, he’s learned to reach onto things (like the hearth and the shelf under the coffee table) to get things. Of course, his favorite targets are his sister’s toys, particularly the toy she is playing with at that precise moment. He also enjoys reaching onto the coffee table shelf and pulling the basket of puzzles onto the floor with him. So, we think that’s part of Little’s issue at the moment. I’m hoping it will sort itself out soon because the laundry, oh, the laundry. Otherwise everyone is doing well. Last week a nasty cold visited us resulting in almost-croup for Boo and lots of runny noses, coughs, and sneezes for the rest of us. Poor Boo was on steriods for four days, and when you give a bad-sleeping baby steriods you better watch out; needless to say, between the cold and the steroids we were lacking in the sleep department. Add to the developmental milestones and the cold the fact that he was cutting his second bottom, front tooth (the first popped through the week before), and Boo was just a bundle of joy (ahem) to be around. We were definintely thankful to see our smiling, happy boy return this week. And so goes life in the sidetrack’d household. See ya next time! I’ve been thinking about it, and I think that I’ve been blogging less because I’m using Twitter and Facebook so much. There’s something about the instantaneous feel of those platforms as well as the fact that I only have to put one sentence together at a time usually. I want to blog, I have things to blog, but with my limited time (especially of late, it seems) without children in lap and underfoot, I’m finding that writing in two minute spurts fits by life a little better right now. I’ll definitely still be around, some times more often than others, but I plan on posting at least a couple times a week. In the meantime, if you don’t already follow me on Twitter I’d love to hear from you, and let me know if you’re on Facebook, too. I think she needs a child’s sized sling or mei tai for Christmas. Matt thinks I’m crazy. November 12-18 is International Babywearing Week and to celebrate Steph of Adventures in Babywearing is hosting a carnival where she’s invited all of us to share our babywearing stories. She’s also giving away a Nest Sling and a Hatchling Sling courtesy of Nonny & Boo to lucky participants. (I would love to have one of these beautiful slings). When Little was born a little over two years ago I’d really never heard of “babywearing” and all of the slings, wraps, and other babywearing accessories. I did, however, feel drawn to the closeness and convenience of having her in a carrier as opposed to pushing a stroller or, especially, toting around an infant carseat everywhere we went. I registered for and received an Infantino buckle carrier and so began my babywearing career. I used the front carrier with Little for about 5 months, but it was never really comfortable for me; I felt like I was constantly tightening and adjusting the buckles and straps. (Not to mention that she’s tall and I’m short, so it wasn’t too long before her feet were hitting me in the knees.) When Little was several months old I found Steph’s blog and through her writing and a few other resources became very interested in wearing my future babies. As soon as I found out I was pregnant with Boo I started contemplating babywearing, what types of carriers I wanted to use, and how helpful it would be to wear baby since I would have a not quite two year old in tow as well. 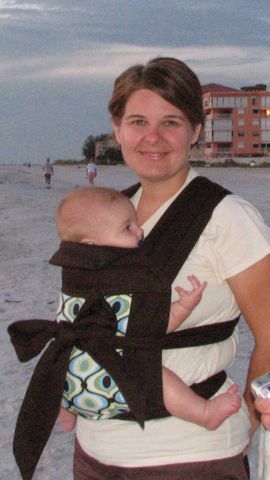 My first carrier was a Sleepy Wrap; I purchased the wrap before Boo was born on the recommendation of my SIL. I started wearing Boo in the wrap almost immediately. He was about two weeks old when we took him out for the first time, so that was his first ride in the wrap. I loved having my tiny baby so close to me and with the wrap I was able to cover his head if needed when we were in crowded places. It also discouraged random people from asking to touch him which was a very nice benefit. Any time I wrapped him he fell right to sleep and would sleep the entire time he was worn. The Sleepy Wrap saved my sanity several times in those first few weeks and months when he was fussy but I needed to be doing something else with my hands (cleaning, cooking, helping Little, etc.). When Boo was a few months old I gave myself heat exhaustion wearing him in the wrap (black) at the zoo (in June) and decided it was time to invest in a new carrier. I tried a pouch sling and couldn’t get one to fit properly, so I bought an adorable blue and green ring sling. I wear my ring sling all the time and love the convenience of slipping it on to run in to a store real quick and for times that we have several errands to run. It stays in the car so that I always have a carrier handy when I need it. I do need to learn some new carries (for older babies) because Boo is getting a little cramped in the kangaroo carry and doesn’t like to bend his legs nicely to go into the tummy-to-tummy carry. Any suggestions for different carries? My current favorite carrier is my BabyHawk. We got it before we went to the beach a few weeks ago and I love, love, love this mei tai. Boo loves to ride in it and look around or sleep sweetly against my chest. He’s big enough now that we can use the back carry some, and I’m looking forward to trying out the back carry with Little sometime. It is pretty much guaranteed that he’ll fall asleep in the mei tai if he’s the slightest bit sleepy, so I’ve used it more than once to get him to nap when he didn’t want to lay down. Babywearing is not a big thing in our area. I’ve seen a few other moms out and about wearing, and I’ve gotten a ton of questions and more than a few strange looks as we’ve been seen wearing Boo around town. I’m happy to say that several of my friends are planning to babywear (at least sometimes) as a result of hearing me rave about how much Boo and I enjoy the experience. Hopefully they will love it as much as we have. I love having Boo close. I love the extra snuggles and kisses I get to sneak in as we go about our day. I love having my hands free to chase Little or do the things that I need to do. I love this babywearing thing, and I’m so glad that we’ve chosen to make this a part of our parenting plan. In fact, I’m trying to convince Matt to add “Babywearing” as a line item in our budget. Think it will work? Hi. I’m still here and everyone is doing fine. I would love to say I’ve been away because we went on a fun trip or because something super exciting was going on, but that’s not the case. I’ve spent the week with a potty training 2 year old (more on that later) and a teething 6 month old (more on that later, too) and a good time to blog just hasn’t presented itself. Sometimes life just gets in the way. Tonight I’m off with my best friend for a girls’ night out to celebrate meeting our Challenge goals. I hope everyone has a great weekend! You are currently browsing the Sidetrack'd weblog archives for November 2008.